Moving along in the bread chapter, this recipe is our first use of liquid levain. 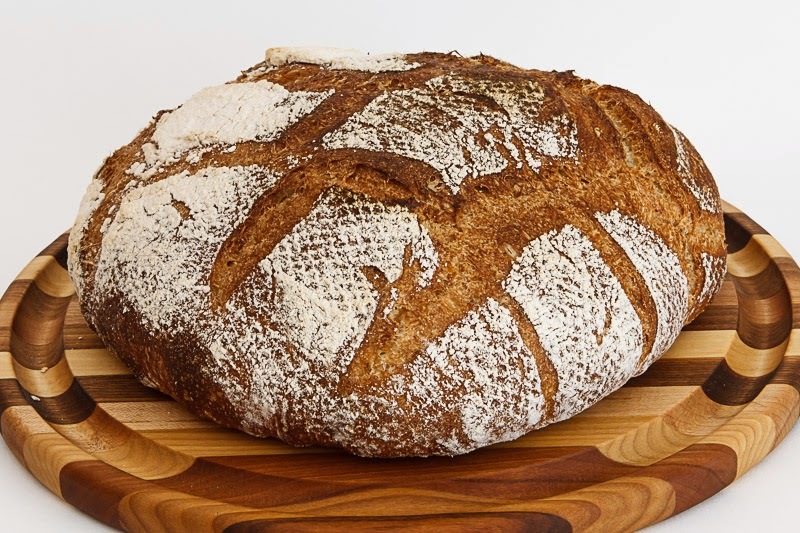 Levain is different from poolish, which we've used previously, in that it's only flour and water, and the yeast is derived from the natural bacteria in the air. 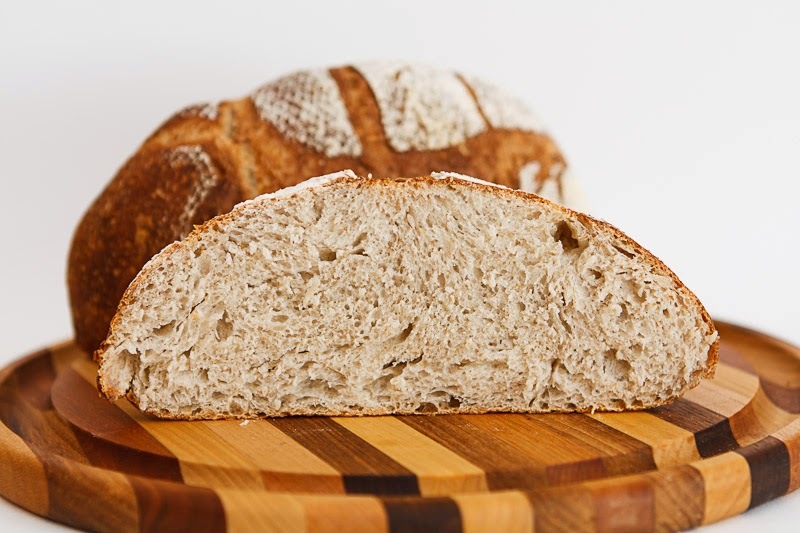 It takes a lot longer to develop, since it's relying on wild yeast instead of instant yeast, but the flavor that results is more complex, and can vary based on how often you feed it. 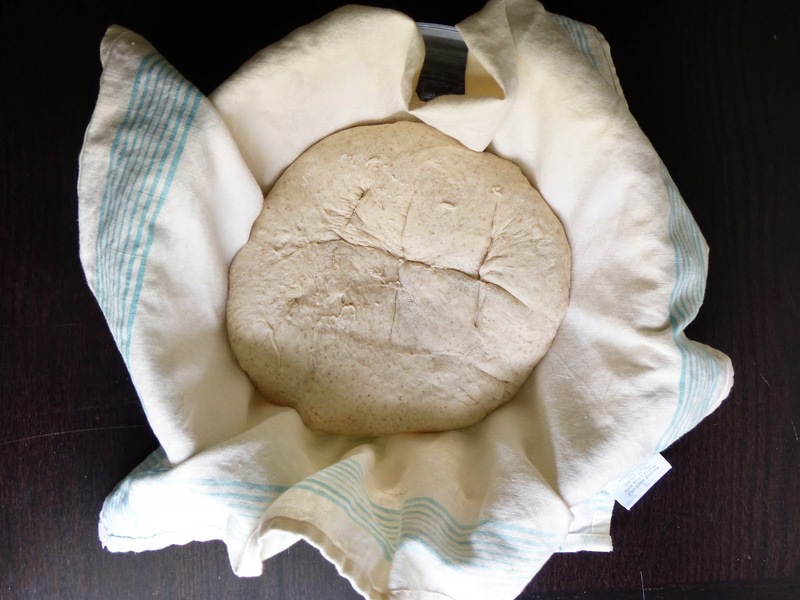 Yes, you have to feed your starter, with more flour and water, twice a day, forever. The flour is food for the yeast, and at some point the yeast eats all the food in the flour so you have to add more. Based on how often you feed your starter, you can make it more or less sour in flavor. 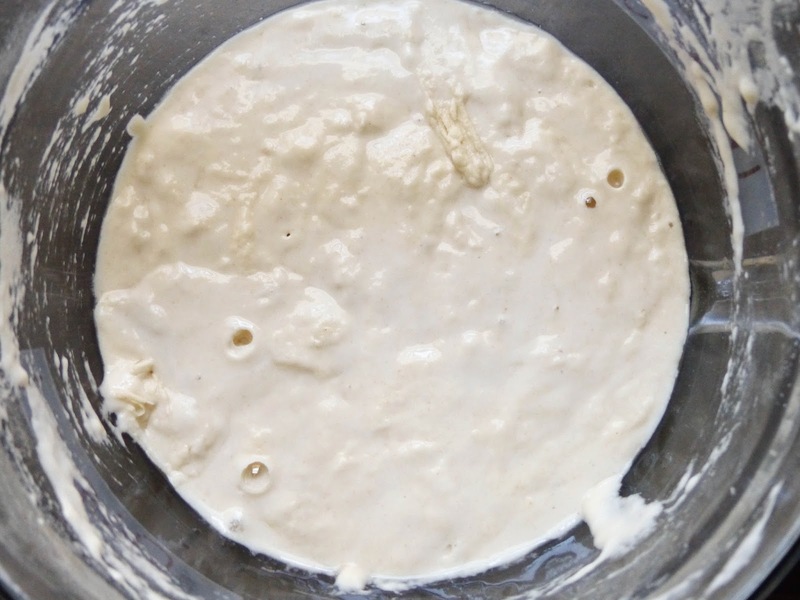 When added to bread dough, it provides flavor and leavening. This dough uses three kind of flour: all purpose, rye, and whole wheat. These all lend different flavors and textures to the finished product that makes it more rustic than the bâtard dough. It's meant to be a simple country bread, something that farmers' wives baked while their husbands were out in the fields in the French countryside. The easy round shape is no-nonsense, and I can imagine it being baked in a large cast iron pan over a glowing hearth. It's great just slathered with butter, or as a vehicle for meats and cheeses. 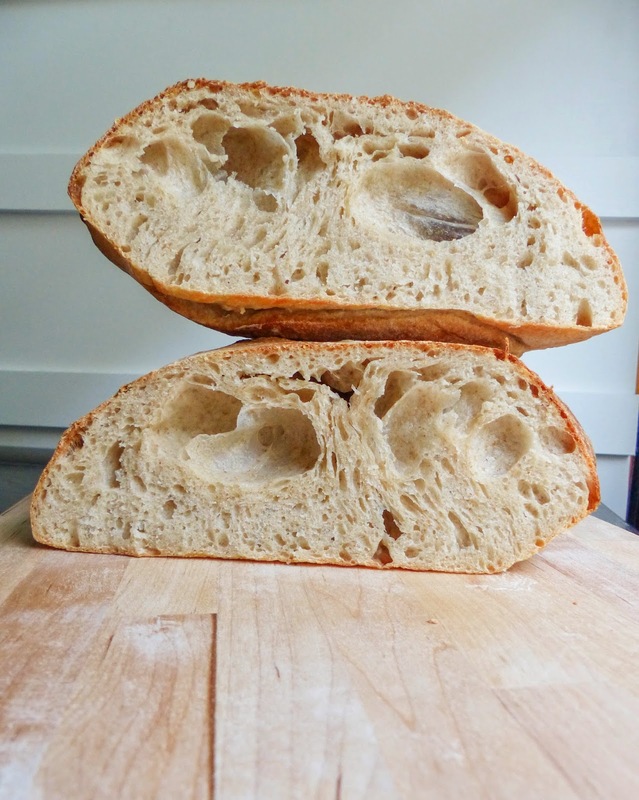 I've never made anything with a levain, although I've heard tales about feeding starters, from people who keep a jar in the fridge that they've had for years. The idea of feeding something on a regular schedule was daunting, mainly because I have killed any plant that dared enter my house due to neglect. But, I figured, I'll give it a shot. I started my levain on a Saturday, the week before I planned to bake on Friday. So that gave me 5 whole days of twice daily feedings to get it going. The book recommends 6 feedings, so I figured I'd be ok. It's not difficult to start and maintain a levain, it just takes time and a LOT of flour! I bought a 5 pound bag on Monday and ran out on Friday. So now I know, I need 5 pounds of flour a week. I also have been going through bowls and glass containers like crazy! Twice a day I'd transfer 150 grams of levain into a new bowl to feed it. Washing these bowls by hand is difficult, so I tend to just run them through the dishwasher instead. I finally realized I could just remove the excess starter from the bowl and add the flour and water, using only one bowl for the entire process. Much simpler! So, with my levain healthily bubbling away, I set off to make the bread. After purchasing rye flour, I was ready to go. The process is more familiar now, the mixing and fermenting and folding. I still am having problems with shaping. I again found the instructions for shaping kind of confusing, so I just did my best. But again, moving the shaped dough from peel to stone mangles the shape too much. The docking of the dough was easy, but I didn't do it deep enough. 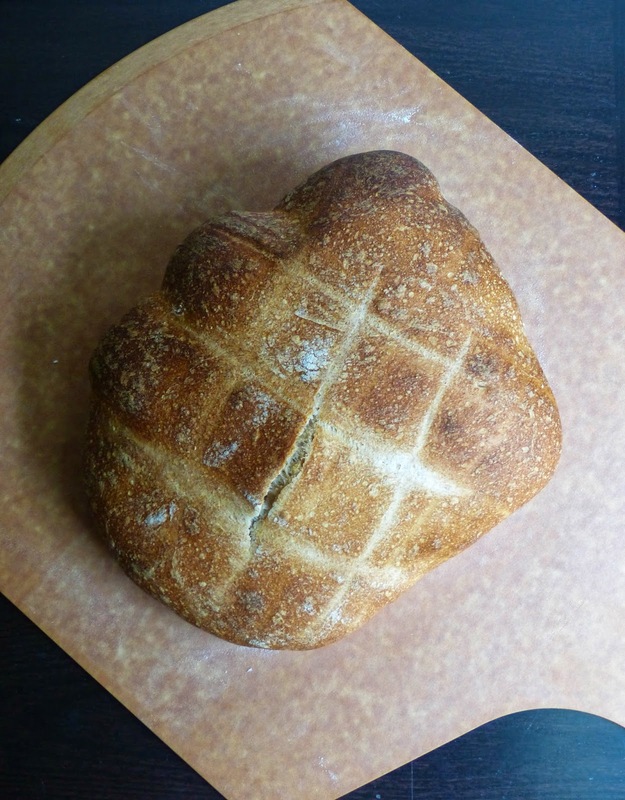 When I pulled the bread out of the oven, it smelled amazing, even though the shape wasn't perfect. It hadn't been scored deeply enough, so not enough steam was able to escape. The inside had a few really big holes and was wetter than I think it should have been. Also the structure of the bread wasn't too strong, even though the crust was crispy and thin. I'd like to make this one again, so I can practice shaping and transferring the dough. I think once I get more comfortable with that, the quality of my breads will improve. Regardless, the bread is tasty and I ate a few slices with butter and fleur de sel, but I think I prefer baguettes. 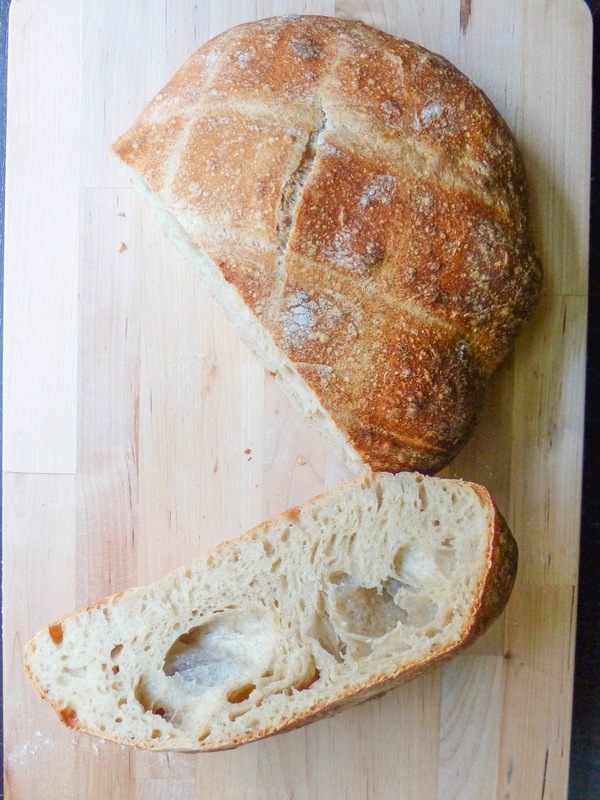 This bread has a subtle sour flavor, is very chewy and moist. Great for sandwiches and easy to make.